Pärnu Yacht Club Guesthouse is situated in a quiet and beautiful location on the bank of Pärnu River in close proximity to the centre of the town and the beach. You can always feel comfortable here as the beach and the river relax you. The yacht club has charming views to the river full of yachts with their masts singing in the summer wind and adding romance to the sunsets of beautiful evenings. You can observe a unique and wonderful site on our terrace – activities and action of the yacht club and traditional Midweek Regattas. There are various concerts on the summer terrace on weekends. We are easy to find – we are located in the historical Pärnu yacht club in Pärnu marine, which was established on the 21 of June 1906. The city centre and the beach are only a short walk away. Our comfortable guesthouse has 5 double, 7 twin and 5 single rooms and one suite with balcony that are named after famous yachts. We can accommodate 31 people in total. All rooms have shower, toilet, TV and there is a possibility for an extra bed. We have free wireless Internet access in the building. Pets are welcome as well. We also help in renting a yacht and organizing joyrides on the bay. 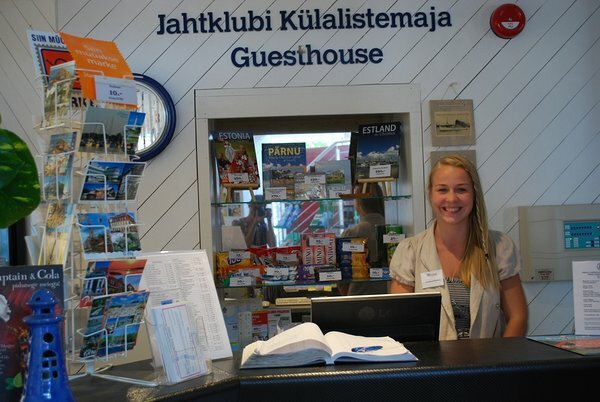 From June to September the guesthouse’s reception desk is open 24 hours a day. Starting from the first of the September You can check in and out in the restaurant. Discover Pärnu - Pärnu sights, events and walking tours.